Laurie passed away peacefully at Élisabeth Bruyère Hospital in Ottawa, Ontario on Monday January 8th, 2018 at the age of 50 years. Loving partner of Tim Wayne. Beloved mother of Sacha Kingston-Wayne and Daniel Kingston-Wayne. Daughter of Diane Kingston and the late Bob Kingston of Hawkesbury, Ontario. Daughter-in-law of Susan Wayne, Jack Wayne and Susan Silva of Toronto, Ontario. Will be dearly missed by her sister Linda Kingston and her partner Ian (Ottawa); brother-in-law Andrew Wayne, his partner Brenda MacDonald, nieces Claire, Esme and nephew Noah (Guelph); brother-in-law Ian Wayne, his partner Dawn Lyons, nieces Zoe and Emma (Ottawa), sister-in-law Sarah Silva-Wayne (Toronto). Laurie was born August 4, 1967 in Dalhousie, New Brunswick and raised in Hawkesbury, Ontario. She attended Pearson College and Trent University and worked at a number of advocacy organizations. She worked at the Public Service Alliance of Canada since 2002. She was diagnosed with breast cancer in 2005 and liver metastasis in 2006. 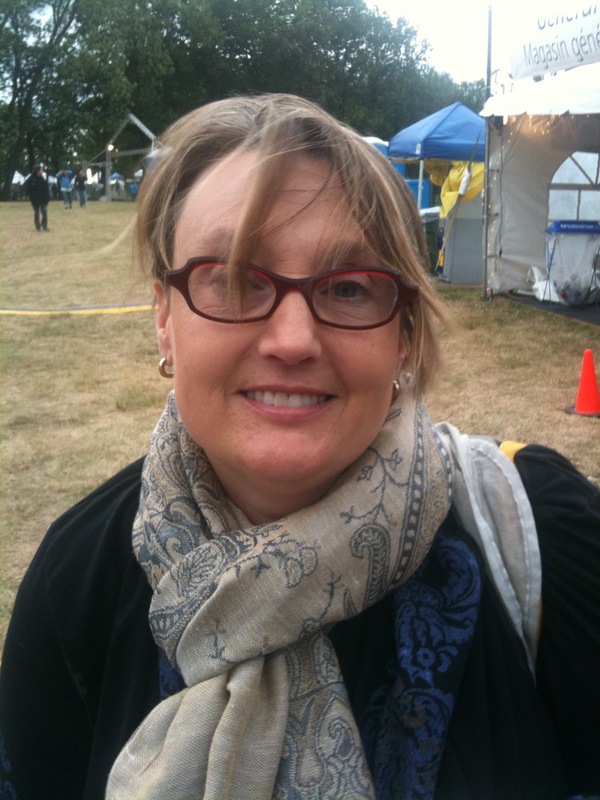 Throughout ongoing cancer treatments Laurie remained an avid reader, writer, knitter, coffee and tea drinker, cyclist, and a good friend to many. Laurie wrote regularly on her blog at Not Just About Cancer and maintained an active presence on Facebook and Twitter. She published a memoir of her cancer experiences titled "Not Done Yet: Living Through Breast Cancer". A celebration of Laurie's life will be held March 3rd at 11:00 at the Glebe Community Centre in Ottawa. Hello All, I have sad news. Laurie died yesterday morning. She was comfortable and pain-free until the end. Her end of life care was exceptional. I am beyond grateful for all the love and support we have received. It has made going through an impossible ordeal possible. As I have been reminded over the last few days, knowing something is coming doesn't make it any easier. In the next while we will be thinking about the best ways to remember Laurie. I would welcome your thoughts and input in the future. Here are the last few Facebook posts I made on Laurie's behalf over the last few months. Apologies for everyone who is not on Facebook or connected with me by email. I would like to let you all know how Laurie is doing and what is going on health wise with her. Over the last few weeks Laurie has been suffering from some cognitive issues that has limited her ability to post and comment here, As these issues got more serious her oncologist scheduled an MRI to try and find out the cause and to make a plan to deal with it. The MRI showed that there are new tumours in her brain. I have not read the formal radiology report but it appears that the new tumours are in the brain proper (where her original tumours were), and likely in the lining of the brain as well. What this means is that the intrathecal herceptin (and later methotrexate) treatment she has been receiving since June 2016 is no longer effective. The new treatment plan is to undergo whole brain radiation and to begin a course of chemotherapy with two new drugs. The whole brain radiation has started with four of the ten doses done. Laurie began taking lapatinib (Tykerb) and capecitabine (Xeloda) Tuesday. The lapatinib is a small enough molecule that it crosses the blood-brain barrier. These drugs are supposed to work well with the radiation therapy. The chemo is taken orally at home daily which limits hospital visits for which we are thankful. There will likely be side effects to both the radiation and the chemo drugs, but she is managing pretty well so far. The side effects will likely mean that it will be difficult to evaluate the efficacy of the treatment for another month at least. My understanding is that goal of the treatment is to kill the tumours with radiation and to slow the progression of any remaining disease. Hopefully this will lead to some recovery of Laurie's cognitive abilities. If so she will be back to writing these kind of updates as she really has a gift for it and I would rather she did it. It is time (past time really) for another update. Laurie finished her final dose of whole brain radiation on November 23rd. During the radiation treatment Laurie's oncologist paused the oral chemo treatment to try and limit the side effects of the radiation. She restarted the chemo treatments on November 27th. After the final dose of radiation we met with the radiation oncologist and the excellent radiation oncology nurses. We were warned that the side effects from the radiation will get worse for the next week and can go on much longer. During the weeks after treatment ended the symptoms did get worse as predicted. Since finishing the radiation Laurie has had worsening fatigue and weakness. Last week it became clear that she was too tired and weak to manage at home. After meeting with her medical oncologist last Wednesday she was admitted to the hospital. She is now on the oncology ward at the General Campus. While the hospital lacks the comforts of home I know she is safe and well cared for there. After experiencing extreme fatigue and cognitive problems Wednesday and Thursday she bounced back a bit Friday and seemed maybe a bit better again over the weekend. Today she got evaluated by a physical therapist and we met with the ward oncologist. They are also planning on sending her for another MRI, hopefully in a few days. Until we get a better sense of what is going on in her brain it is difficult to make plans. It will likely be at least a few more days until we have enough information to figure out next steps. The only truly consistent thing is that nothing ever happens as we expect it to, almost regardless of what we were expecting. Through all of this the chemo has been paused again to give Laurie the best chance to regain her strength and energy. This has been a challenging time. We would be lost without our friends and family. Please continue to take care of yourself and each other. Laurie had her last dose of whole brain radiation on November 23rd. As I mentioned in the last update she was suffering from side effects that made it difficult to stay at home. She was admitted to the oncology ward of the General Campus on December 6th. During her time there she remained extremely fatigued. After a week she was sent for an MRI to try and see what was causing the fatigue and ongoing cognitive losses. The MRI showed no significant new growths but also no improvement. As well, we learned that Laurie should be doing better post-radiation than she was. Her long-time oncologist let us know that it did not look like she would be getting better. We discussed restarting the chemo, but I learned that it was unlikely to help, and the side effects could still be difficult. Since she is not in active treatment (no more chemo and there cannot be additional radiation post-whole brain) we were able to move her out of the acute care oncology ward which was noisy, difficult to visit and not set-up for longer term stays. Since moving to Elizabeth Bruyère, Laurie been able to rest and has regained some energy. She is comfortable and is being treated very well. It is an easier and more pleasant place to visit with good facilities for patients and their friends and family. I have had very good communications with the doctors, nurses and social worker. After spending time with her at the General Campus it is a relief for me to see her there. The need to post another one of these updates speaks for itself. I'd of course rather not have to do so. While the situation is difficult, Laurie is comfortable and being well cared for. Days start to get longer tomorrow. We remain surrounded by love and caring people both near and far. Hello All, it is time for another update. Laurie remains at Elizabeth Bruyère Palliative Care Unit. She is being exceptionally well cared for there. The doctors, nurses and support staff are really good at their jobs which includes making sure Laurie's friends and family are supported as well. The unit is quiet and as institutional places go, not a bad place to spend some time. Like all of Laurie's health care, this phase has presented itself with new things to learn and process. Elizabeth Bruyère has resources available to help friends and families which I have found really useful. I have also discovered some online resources that have helped including the Canadian Virtual Hospice (http://www.virtualhospice.ca). If you are unfamiliar with palliative care there is a useful overview on this site. Laurie is still comfortable and and mostly pain-free. Her current treatment is focused on keeping her that way with as few interventions as possible. She is slowing down. Meals are taking longer. She is spending more time sleeping. It all seems like a natural response to what is going on. It is sad and heart-breaking, but also really lovely to see her being so well cared for. Witnessing the support of friends and family near and far has been awesome and wonderful. Please take care of yourselves and each other.